Very unique trade show messenger bags. Great investment and bulk order for my business. Thanks Custom Earth Promos. Not only did the bags come out way better than anticipated but I didn't even realize every product CEP has is eco-friendly. Durable bags for a great price. 5/5 stars. Just what I needed for my business. The logo came out wonderful. Really impressed with this company entirely. Eco-friendly product for a very affordable price for all. Used these bags to help promote my business and it went over extremely well. Eco-friendly product that can be used for multiple purposes. These were a great promotional hit for my business. Eco-friendly product that serves so many different purposes. These bags are perfect for on the go usage! So durable and versatile! Will definitely order again! Love how Custom Earth Promos walks me step by step through the process of my orders they really care and always updating me. Great product love how durable these bags are! This is the second order I placed for the messenger totes, I was impressed by the quality of the first order, I had to place another one. I wanted catchy and creative way to advertise my new business. This was an awesome way to combine the two. I highly recommend this for new business owners. Versatile, great item that really helps with organization. Doing business with Custom Earth Promos was a joy. Thanks for all the hard work. My tradeshow messenger bags have been great advertisement for my business. These messenger bags really promote my business well and help me to stay organized. Creative way to stay organized and look good at the same time. Such a classy item. Very impressed with the quality. I needed a bulk order of messenger bags that I could put my business logo on. Custom Earth Promos met all my demands. I sold out of these at my festival. Customer service really is great here. We ordered these messenger bags for every student in the district. Helped them to stay organized and also let them represent what school they attend. At first I wasn't sure how well this material would hold up in comparison to plastic. I was really surprised how durable and well it held up. In saying this, I'm thankful I can be of service to the earth and be eco-friendly. Cool way to advertise, and be creative all in one product. Very durable too. Needed 6,000 messenger bags. Put my order in and received it earlier than anticipated. Above average service. I called this company to ask a question, I was pleased when I was able to speak to a real voice on the other line. I can't stand automated services, having someone help me right away was a great and secure feeling. The Custom Earth Promos' Trade Show Messenger Bag is among our most esteemed and eco-responsible coveted promotional tote bag marketing tools, effectively heightening industry and customer engagement and strengthening the brand image of any business in just a short period of time! Our custom totes are fully loaded with all the must-haves for any marketing aid, sporting a tactical and sensible design built for optimized usability and productivity while supporting a vital environmental cause. All in a package of trendy edge and eye-catching appeal! With a bold imprint area of 10" W x 7" H to proudly display your business logo, custom message or slogan, our reusable messenger bags optimize exposure in their custom graphic showcasing as well as the frequency of use. 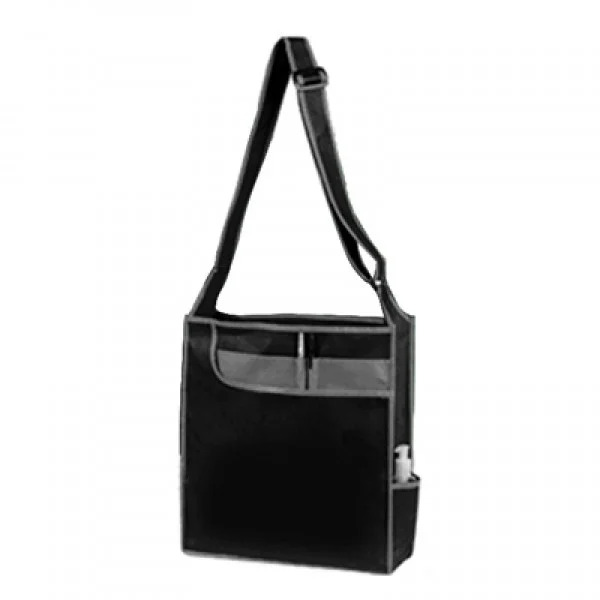 The versatile design with various pockets, secure pen holders, and large open side pockets provides everything a professional, student or service worker could possibly hope for in a tote bag. All while being reusable, recyclable and stylish. These factors are certainly going to be considered when your customers, employees or clients decide on making the custom Trade Show Messenger Bag their go-to choice for everything from running personal errands to executing professional tasks. Based on popularity and demand, we can conclusively say that you won't have to think twice about choosing these Trade Show Messenger Bags for your corporate conventions, business function or company milestone celebration. Their effectiveness is bound to reflect on your brand's exposure, visibility, and recognition, growing your brand in multiple yet simultaneous ways. 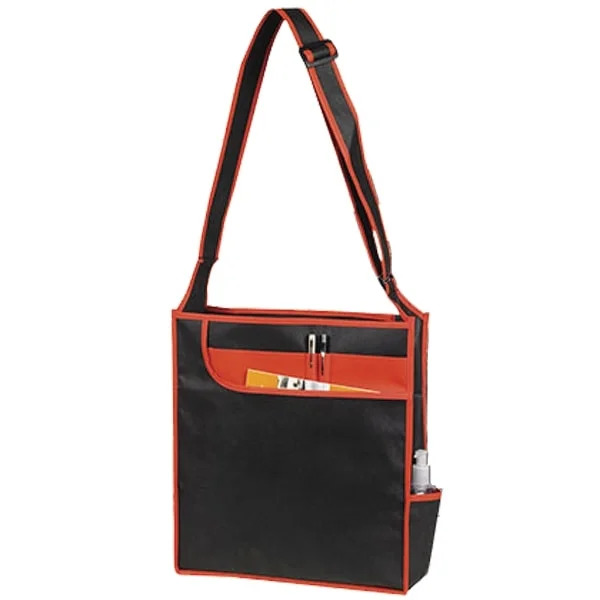 This eco-friendly messenger tote has the true markings of an eco-savvy tool that promises a better outlook for the environment, brighter future for your business and a stylish new accessory for your connections. Everybody wins! Trade Show Messenger Bags cater to environmental issues that spark from heaps of piled up plastic waste and the release of pollutants during the manufacturing process (which is mitigated in this case as these bags are made for re-usability). Customers will immediately notice the responsible approach and action your business is taking on behalf of environmental causes. They will be inspired to join you in the fight for planetary preservation and brand admiration will blossom from this noble act, recognizing your business as a responsible entity that cares for environmental causes. 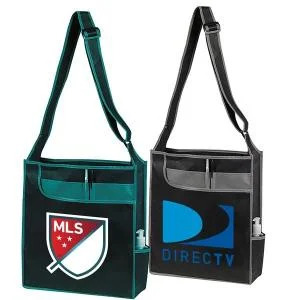 This will foster brand loyalty and increase word of mouth marketing as an added bonus to the increased exposure provided by the promotional bag itself. Our top-notch production equipment keeps the production times in line with tight deadlines. We also send you virtual proofs of the customized bag as soon as we receive the product specifications from you. This will give you a feel for how it will conceptualize in reality. If there are revisions you'd like to make on the blueprint, no need to worry. Custom Earth Promos will provide you a complimentary revision of the first design that you decide upon, guaranteeing the final product will encompass everything you want to convey on behalf of your brand. With our custom production facility, we cater to all our customers promptly and on time. Our careful revisions and expert designers make way for state-of-the-art multi-pocket messenger bags, a proficient inclusion to your marketing strategy!